I'm Aaron Graber with Ventrac. 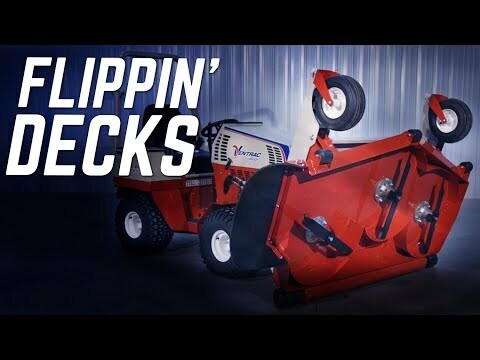 finish mowers and show you the process of using it. It also makes the process quicker of changing blades, sharpening blades. You can also store or transport the mower deck in the service position. Which gives you more space on a trailer or in a storage facility. First, make sure the deck is in the lowest cut height position. Now you're ready to flip the deck up. Be sure to replace the safety pins back underneath the deck lid. Thanks for watching this video on the hydraulic deck lift kit. For more information, visit our website at Ventrac.com or visit a dealer near you.